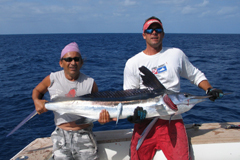 Both OVER UNDER and LOW PROFILE will be fishing in the Abacos targeting billfish, wahoo & tuna this season. We are pleased to be able to offer full packages in conjunction with Green Turtle Club & Marina! 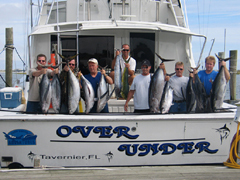 Packages include accomodations, meals, and fishing. Flights can also be arranged via our own Private Air Charter service! 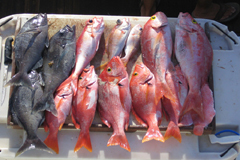 Snorkeling, Light Tackle, Big Game offshore fishing, as well as bottom fishing and trolling for grouper are all things we can do on your Green Turtle Cay Fishing charter. Just tell us what you want to do! Green Turtle Cay has an uneven coastline with deep bays, sounds and delightful beaches. The Island is 3 miles long, 1.5 miles wide and in places rises to a height of over 80 feet. Its name originated from being host to a thriving population of Green Turtles. Unfortunately, over the years most of the turtles were hunted and turned into soup,while those still remaining in the nearby waters are now protected. Green Turtle Cay is not only diverse, but it captures the quaint and harmonious atmosphere that is a trademark of the Out Islands. Many of the inhabitants of Green Turtle Cay are descendants of the British Loyalists who decided to leave the United States following the American Revolutionary War and settled here in the 1780's. The Loyalists should be credited for starting the agricultural tradition in the Abacos. The Village of New Plymouth on Green Turtle Cay, one of the areas settled by Loyalists in 1783, is named after New Plymouth in Massachusetts. The architectural design of the houses is definitely New England style -- tidy, peaked-roofed and brightly and cheerfully painted. It is known as the hub of the Abacos and, like other cays, it is known for boat-building. The residents here had a reputation in the past for growing pineapples. Today this industry no longer exists and New Plymouth is primarily a quaint little fishing village, which makes it very attractive to visitors. Call us for your Green Turtle Club Fishing Packages! Take me back to Bahamas Charter Packages! 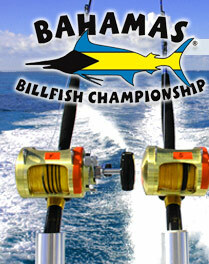 Over Under will be available for charter for all legs of the Bahamas Billfish Championship Series (BBC). Read about Captain Trey Rhyne's recent family adventure to Marsh Harbour! 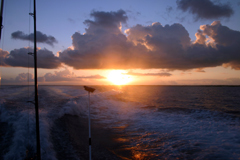 We recommend getting the Abacos Cruising Guide for lots of great information about this area.